On October 20, 2012, I was elected as Councillor for District 7, Peninsula South Downtown of Halifax Regional Municipality. I’ve archived the campaign site here on my blog, so that all my web material is all in one place. A full listing of every campaign blog post can be found here. Below is the “Better Ideas” page that links to my various articles and campaign promises from the 2012 campaign. Halifax is an amazing vibrant city with passionate and caring citizens. For much of the last decade we have witnessed the ineptitude of a city government with no vision. Everyone I talk to is frustrated with a council that is not able to keep up with the energy and change that is evident in our city. It is time to elect people with better ideas for Halifax. This is a Council that is shrouded in secrecy. 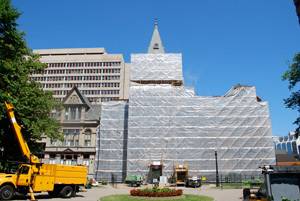 In 2011, HRM Council met in secret over 25 times, on issues ranging from selling closed schools to the concert scandal. We need to fix what’s broken with HRM Council and make it transparent, actively encourage citizen participation and ensure that Council follows its own rules. The city continues to sprawl uncontrolled while the downtown core is neglected. A lot of our energy and the city’s budgets have been used to plan and subsidize unsustainable sprawl. We need to grow sustainably and ensure fair re-investment of the tax dollars into the core. This Council spends $78 million on traffic infrastructure outside of the city core while cutting hours for a vital link between communities, the Halifax-Dartmouth Ferry. Halifax needs to spend smarter on appropriate, affordable projects while maintaining our existing assets and services at a high standard. It is time to elect Waye Mason. He has better ideas for Halifax.